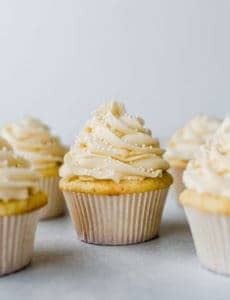 Absolutely perfect vanilla cupcakes with vanilla frosting are super moist, buttery and melt in your mouth. Topped with silky smooth vanilla buttercream frosting - a classic combination! Make the Cupcakes: Preheat oven to 350 degrees F. Line standard muffin/cupcake tin with paper or foil liners. Whisk together flour, sugar, baking powder, and salt in bowl of standing mixer fitted with paddle attachment. Add butter, sour cream, egg and egg yolks, and vanilla; beat at medium speed until smooth and satiny, about 30 seconds. Scrape down sides of bowl with rubber spatula and mix by hand until smooth and no flour pockets remain. Make the Vanilla Frosting: Using the whisk attachment of your stand mixer, whip the butter on medium-high speed for 5 minutes, stopping to scrape the bowl once or twice. Reduce the speed to low and gradually add the powdered sugar. Once all of the powdered sugar is incorporated, increase the speed to medium-high and add the vanilla, mixing until incorporated. Whip at medium-high speed until light and fluffy, about 2 minutes, scraping the bowl as needed. Frost cupcakes as desired (cupcakes are pictured with the frosting piped using a Wilton 1M decorating tip). The cupcakes can be stored at room temperature in an airtight container for up to 4 days. You can store the frosting in the refrigerator in an airtight container for up to 3 days; let it come to room temperature and then give it a quick whip in the mixer before using.